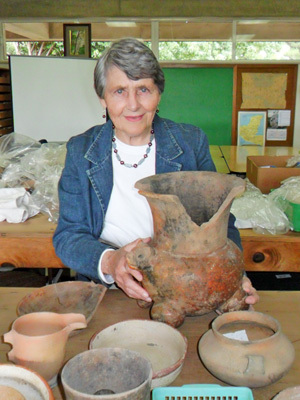 Doctora Popenoe took the author to her lab at the Universidad del Valle de Guatemala, where she founded in 1982 an impressive Department of Archaeology. Its 5-year course of "Licenciatura en Arqueología" currently has 20 students ... funding for their grants has run out and she makes a plea for donations ... please read below. If you would like to donate any amount, small or large, to help students enter the course, click here to find out how. October 2012: Oldest Maya royal tomb yet found in Mesoamerica: 2,500 years old, making Tak'alik Ab'aj "cradle of Maya culture". Click to read the story in Guatemala Times and the story in Prensa Libre and a BBC report (click on the image to run the video report). All of them credit the carbon dating test as proof! Tomas Barrientos conducts a class at the Universidad del Valle de Guatemala. He explains why the department needs donations for student grants. Excerpts from the interview are in the March REVUE and the whole interview just below. The photo is from an interesting class at UVG, led by its Director, Tomas Barrientos. There were students from Guatemala, El Salvador and Honduras (there was one recently from Nicaragua). 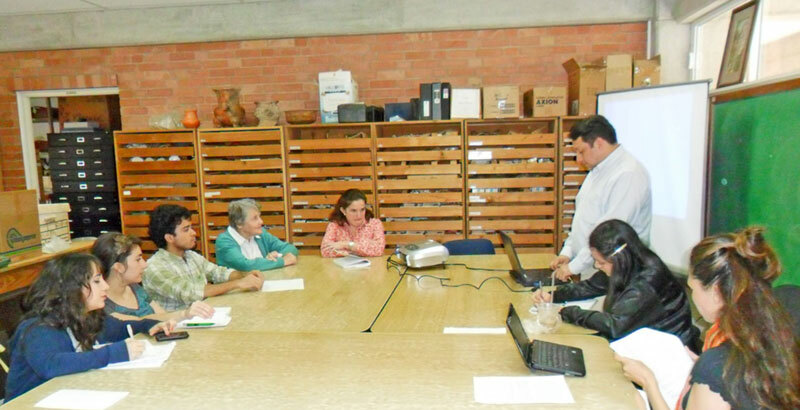 The class focused on late Classic period sites in the “Altiplano” … there was, at the time, a proliferation of sites, many of which remain to be explored, Barrientos explained. This was a period, he said, when linguistic groups were evolving, such as the Tzutujil, Kakchikel and K’iche of today. When he mentioned one site, Doctora Marion, who was observing the class, was asked for a sample and found it quickly in one of the cabinets holding the department’s collection. It was examined by the students to illustrate the type of ceramics produced in the period, which teaches archaeologists to identify and date objects they find. Academic advisor to "Proyecto Nacional Abaj Takalik". Dra. Popenoe has two labs, one at Tak'alik Ab'aj and another at UVG in Guatemala City, where this photo was taken. Universidad del Valle, Guatemala City. 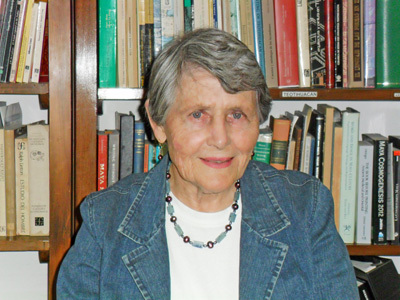 The university, where Doctora Popenoe is a professor, is a private, not-for-profit, secular university, founded in 1966. Dra. Popenoe has set up and guided the archaeology department since 1982, which is now directed by Tomas Barrientos, one of the graduates of the program. Doctora Popenoe says that funding is urgently needed to enable students from families with limited resources to study in the archaeology department. Currently such students cannot afford to start the program because of the 5 year commitment to obtain the degree of "Licenciatura en Arqueología". Marion, in a poor country such as Guatemala, archaeology is something of a luxury, is it not ? Can you explain why people should give money to fund grants for students ? Please click here to go to a detailed description of the course, which is on this page, below, in Spanish. 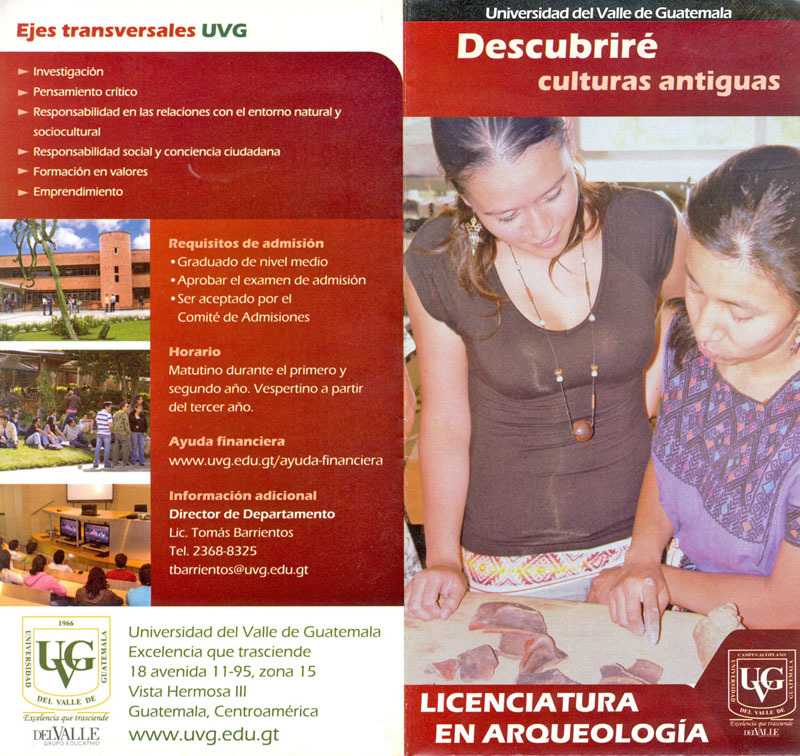 What do you see as the mission of the UVG Archaeology Department ? Our mission is to educate archaeologists from a multidisciplinary approach, bringing the basic principles of anthropology and other social sciences together with a scientific perspective. Taking advantage of the rich archaeological heritage of Guatemala, the student at UVG is trained to discover and study our past in order to know the fabulous pre-Columbian history of this country, and to understand the general processes of humankind as a tool to improve our present as well as to shape a better future. How many students does it have ? We have an average of 20 students in total, with 5 to 6 new students every year. Being a small department, it allow us to offer a personal education that also maximizes all educational resources we have. Our students are also diverse, coming from all parts of the country and even from other countries of Central America. What do they do when they graduate ? I suppose you are a shining example, right ? Our archaeological degree has been designed to offer the student a wide selection of options for specialization. 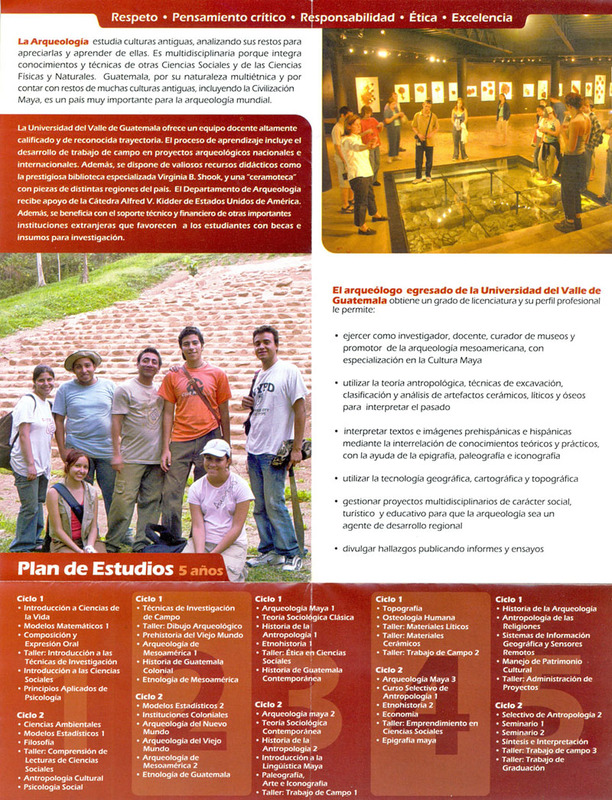 During the five years of the Licenciatura degree, the student take different courses of anthropological and sociological theory, as well as technical courses of data analysis, including Geographic Information Systems, topography, and analysis of lithics, ceramics and human bones (forensic anthropology). Other courses introduce specialties such as epigraphy, iconography, linguistics, ethnohistory, cultural heritage management, and museum studies. In addition, the student is open to take courses from other departments, such as botanical studies, colonial history, sustainable tourism and many other applications of archaeology. There are many good causes that people cas support. Why donate toward grants/becas for students or archaeology? The main reason is because Guatemala is a country with a great archaeological potential. Archaeology is one of the many underdeveloped activities that should contribute to the future improvement of the country, in terms of opening new economic activities such as tourism. Supporting the education in archaeology will produce better professionals that need to tell the true history of Guatemala, bringing pride to our past as the basis for the future. Nevertheless, many young people, especially Maya, who want to study archaeology at UVG have to give up because of economic limitations. Despite the availability of different financial aids at UVG, there is much need of a direct support coming from donations, whether through individuals or institutions. What are you doing with the Shook archive ? The archives of Edwin Shook are among the best educational and research resources at UVG. The thousands of photographs, notes, drawings and letters are now classified and properly stored. We are now in the process of digitizing them and making them available through the web as part of the Centro de Documentación Sociocultural – CDS, together with other important archives donated by prestigious archaeologists and ethnographers such as Juan Pedro Laporte and Nancie González (http://tollan.uvg.edu.gt/cds). This will be the subject of another REVUE article. Any questions about the program and donations and how they will be used, please contact Matilde Ivic de Monterroso, the department's assistant to the director, Tomas Barrientos. She is at ivic@uvg.edu.gt or +502 2364-0336, ext 476. In a March 2013 issue, the REVUE published a profile of Doctora Popenoe, focusing on her plea for donations at the Archaeology Department at the Universidad del Valle in Guatemala City. For details of a trip to Tak'alik Ab'aj click here. 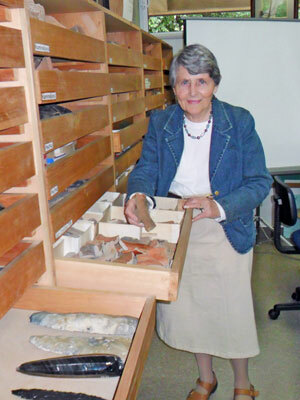 Doctora Popenoe de Hatch in the UVG lab, with collections from a variety of Maya sites. Click the photo to see a larger image. Doctora Popenoe de Hatch at the Universidad del Valle, Guatemala City. This page was last updated on 02/28/13.